Anthony Blight a Cornishman; was introduced to Talbots by his father, Arthur, who acquired the family's first Talbot in 1943 - this is where the story starts as he became one the great exponents of Roesch Talbots. 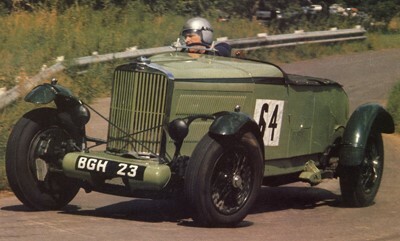 In 1960 he bought his first 105 Talbot team car, GO52, from Charles Mortimer and then, with Mortimer's help, he had by 1965 gathered in all the 1931 105 team cars, GO51, GO52, GO53 and GO54. In addition he acquired and rebuilt BGH23, one of the 1934 Alpine Trial team 105s in which Mike Couper was also successful at Brooklands, finally lapping in 1938 at 129.70 mph, the fastest lap ever by a 4-seater car. With these cars Anthony had many successes in V.S.C.C. and other clubs' racing and speed events, particularly the Pomeroy Trophy, which was ideally suited to the Roesch Talbot in the days when it was a combination of tests at Silverstone and a road event. Anthony often invited other drivers to compete with his cars, but he himself won the Pomeroy Trophy outright in 1966, 1967 and 1969 in BGH23 and in 1967 with GO52. In 1966 in the Coupe de I'Age d'Or race at Rouen, BGH23 driven by Martin Morris finished 5th and was on the same lap as the three ERAs and the Sunbeam Tiger, having been timed at 121 m.p.h. past the pits. In 1970 Anthony's monumental book ‘Georges Roesch and the Invincible Talbot’ came out after eight years of extensive research, it covers the story of the touring, but mostly the racing Roesch Talbots in meticulous and fascinating detail, which will stand for ever as a great work of art in its own right. The book’s primary purpose was of course to ‘save’ the Roesch Talbot, a task in which it succeeded admirably, for it’s no exaggeration to suggest that without Anthony's impassioned advocacy in the book, the marque could have virtually died in the early Sixties. His personal example in buying, restoring and successfully racing BGH23, the entire Works 105 racing team, and later in restoring BGH21 prevented many Talbots being broken up and melted down in scrapyards across the country after being pronounced ‘untouchable’ by people unable to comprehend that Roesch's cars, designed and built as an entity, must necessarily be rebuilt in the same way rather than in the piecemeal fashion which would suffice for most other marques. Later on in his life at the age of 63, Anthony entered BGH23 in the 1989 Pirelli Marathon. 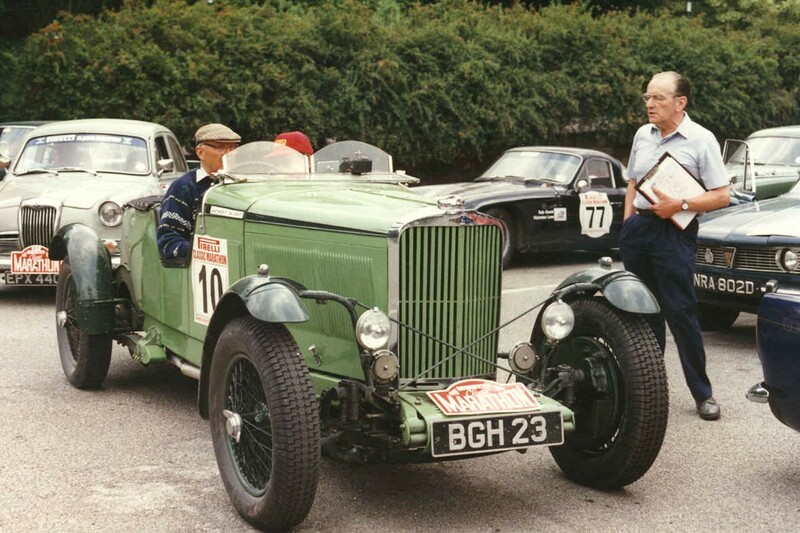 The only pre-war car in a field of 113, his navigator James Fack was privileged to witness at first hand the remarkable fusion of man and machine that was Anthony in his beloved BGH23. In anybody else's hands BGH would have been but cannon-fodder to the powerful late-60s 2-seaters competing against her; but with Anthony at the wheel, as the pale green projectile hurtled screaming through the pine forest of Bokrijk in Belgium, our more perceptive fellow competitors realised at once that what they were witnessing was a minor miracle: a pre-war car, driven by a grandfather, equalling the times of young men in Jaguar E-Types and Ferrari Berlinettas. Competing was Ove Andersson (former Swedish rally star and at the time current manager of Toyota Team Europe), who told the world's press at the Finishers' Dinner, his outstanding impression of the Marathon was ‘without any doubt, Anthony Blight's handling of the 1934 Talbot.’ On many stages Ove in the Toyota 2000 G.T. had been no match for Anthony in BGH, and he was quite big-hearted enough to admit the fact. Sadly Anthony passed away the following year in July 1990 while recovering from a heart valve operation, to remedy a heart murmur diagnosed many years previously. In fact he had postponed the operation in order to take part in the 1990 Mille Miglia in May in GO53 with his son-in-law Stephen who can vouch for the fact that he had lost none of his enthusiasm, sadly it was his last event. Reflecting Anthony’s enthusiasm and passion for Talbots, the Talbot Owners’ Club was delighted to accept a generous donation from the Blight Trust in 2008, the 1934 Alpine Cup, to mark and honour Anthony’s dedication and achievements over many years of his life to the marque. Anthony Blight's long-awaited work on the Roesch Talbots, which is the culmination of eight years of writing and research undertaken by a non-professional writer against the background of restoring and racing eight historic Talbots of the period the book covers, is altogether remarkable. Apart from the difficulty of comprehending how the author found time to write it and also efficiently look after his splendid motor-cars and his professional commitments—Mrs. Mary Blight calls it the longest pregnancy in history—the completed work must rank as the most comprehensive one-make study ever compiled. It is, in fact, three books in one—the story of the romantic and unique career of the late Georges Henry Roesch (1891-1970), who went to Paris to seek his fortune and became the designer of one of Britain's best-engineered cars; the complete account of these simple but effective push-rod-engined cars in races and trials, in which they so notably upheld British prestige after the demise of the big green Bentleys; the history, in fascinating detail, of the sports-car races of the late 'twenties and the nineteen-thirties, races which, run under complex handicapping systems, over ingenious courses, with unbelievably mixed entries, filled in for drivers, engineers, enthusiast spectators and the writers of publicity material after the decline of costly Grand Prix racing. "Georges Roesch and the Invincible Talbot" is not light reading. Indeed, it is about the most obtuse motoring book I have read, apart from engineering text books. But it had to be written and only Anthony Blight could have tackled a task of such magnitude as it should have been done. He has produced a wonderfully continuative narrative, superbly readable. I have a personal interest in this book, which, once admitted, may suggest that someone else should have written this review. I rekindled Blight's appreciation of the finer points of Roesch's great engineering talent by articles in Motor Sport in 1957, before the time anyone had devoted much space to this great Swiss engineer; and very hard going those articles had been, for Roesch, while being exacting in what he wanted me to say, was at the time completely disinterested in his past achievements, believing that his designs had been copied without acknowledgement by mass-producers, so that after a brief interview he left me to write the article from old instruction books, and such other material as I could muster. How fortunate that, before it was too late, Blight was able to extract a good deal more from this charming but stubborn man. My wife and I had formed the STD Register (having owned several Sunbeam cars) and brought in to join the Wolverhampton make the Roesch Talbots, which rallied some more data. Charles Mortimer acquired three GO Team Talbot 105s and began to compile their history. Blight bought these and others and took on the job of historian. I found him a publisher but when the bible-size mss. was shown to them they threw up their hands in horror and asked for a gentleman's agreement, the contract torn up. The book was the most fascinating and derailed I had read and I was relieved when Grenville, who fond paper for my Brooklands' tome when other houses were down to their last thin toilet roll, agreed to take on the formidable chore of publishing It. I can say that had I never heard of it until I received a review copy I would have written exactly the same notice as I am writing now. The book ranges over every aspect of Roesch and the invincible cars he created. There is the account of how Louis Coatalen gave the inexperienced but confident young designer the chance to devise the 14/45 six-cylinder Talbot, after his earlier designs had been still-born—his astonishing 50-litre aero-engine, 30 cwt. lorry, etc. The subsequent development of this and all the later Talbot models is treated as thoroughly as any one-make book has dealt with its subject. This is interesting stuff to all Roesch Talbot owners and essential to those restoring them. But what makes Tony Blight's Talbot bible irresistible is his meticulous description of Talbots in competition. Here he was very fortunate to have access to the records, notebooks, even the bills, kept by Arthur Wingrave Fox, who ran the Talbot teams in innumerable races with works co-operation, with the excellent results this painstaking author recalls. (Intriguing are the details of the 20/60 Hurlingham Vauxhalls which Fox would have raced instead, had GM proved more co-operative). Blight does not just repeat parrot-fashion the contemporary reports of these races—the TT, the "Double Twelve", the Mille Miglia, Le Mans, the Irish GP, the BRDC 500-mile Race the JCC 1,000-mile Race, the Alpine Trials, in which the silent, crankcase-camshaft Talbots did so much for Britain. He shows how Fox planned his strategy for each event, according to the current capabilities of his Talbots, the class-handicap situation and the opposition. Each race of importance to Fox's team cars is so fully and graphically covered that the book becomes the best history yet of the motor racing of this type and period. The detail—which I regard as so important to this type of writing—is, like the cars being described, unique—the cost to Fox of each one, following discussions with the factory, the bonuses paid, even the numbers of the hotel rooms in which the drivers stayed, how these drivers were chosen and taken on, down to a note of an unposted letter addressed to Dudley Froy, picked out of the wreckage of the Talbots which crashed in the unhappy "Double Twelve" of 1930, and even the quantity of beer Fox ordered for the "Double Twelve" mechanics! Yet, thanks to his dedicated research and Arthur Fox's meticulous notes, the book is as authentic as any piece of motoring history I have read. It can be dull in parts for any but equally-dedicated Roesch fanatics, but most of it is absolutely enthralling, and dramatic withal, as the story of how the smaller Talbots from Barlby Road, London, go out to vanquish the mighty cars from other Nations unfolds. The crash which happened to Corinne Eaton's Bentley on the way to Le Mans, in 1932, which injured Roesch and his foreman-mechanic, Wilcockson, is another piece of drama in a book which recaptures so exactly the spirit, the problems, of motor racing before the war. I will not attempt to outline here why the Talbots were so remarkable, for it is all in the book. Blight is unashamedly out to prove the superiority of Roesch's designs in almost every respect, from comparisons with contemporary production cars of other makes and those of today, to how they disposed of the race opposition, which in itself leads him into highly interesting exposures of famous and obscure sports/racing cars of the 1930s. 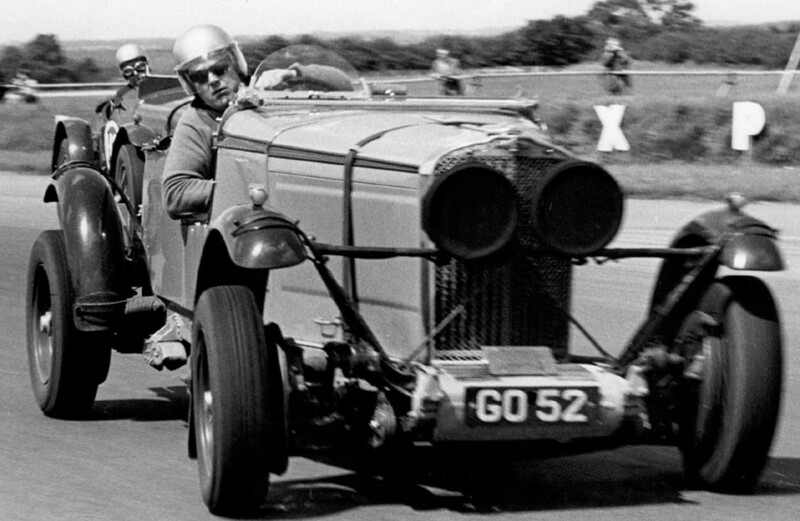 He clearly has a contempt for vintage Bentleys (although his father owned two) and no use for twin-cam 3-litre Sunbeams, even though Roesch himself did what he could to improve this STD inspired, Barlby Road-built engine. He even picks to pieces the Jaguar XK engine in comparison with Roesch's push-rod o.h.v. power units. Never previously has an author of this kind of book had the advantage of driving and racing the very cars about which he is writing (eight in all, including the GO team cars and BGH23). This alone makes Blight's great book unique. I can strongly recommend it, expecting it to give the same intense pleasure to those who read it as checking the proofs gave to me. Lord Essendon, who as the Hon. 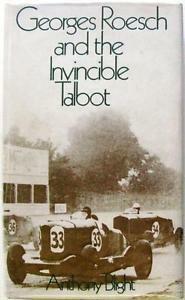 Brian Lewis, was one of the racing drivers who consolidated the invincible Talbot reputation, says this far better than I have, in the Foreword. Incidentally, the frontispiece photograph depicts Owens, Wilcockson, Scott, Nicholl, Saunders Davies, Lord Brecknock, Rose Richards, Robertson, Fox, Eller, the Hon. Brian Lewis, Roesch, Cobb, Reeves, Hindmarsh, Symons, Fitzgerald, Woolfe and Day, after the 1932 Alpine Trial—and that is the cast of the book. Regarding your book "Georges Roesch and the Invincible Talbot". As one who carried out 99.9% of all engine testing experiments for Mr. Roesch, I am extremely interested. I joined the Talbot firm in 1920 and left in 1947, and I wonder how many of the people who were with us in the early days are still with us—not many, I am afraid. Seen through my eyes, Georges Roesch arrived at the firm when things were bad. He looked, to me, very young (he turned out to be 10 years older than me). Much has been said about his inventive mind and engineering skill, but little of the equally wonderful staff he joined, names at this time evade me, a few come to my mind, Wyres, Knell, Craighead, Saunders, Brown, Kneebone, Bill Berry, Thompson, and many, many others whose skill was in immediate demand by many fine firms when we were turned over to the Rootes tinware people. I wonder how many projects Roesch had up his sleeve in 1935. I know the straight-eight was shown and not marketed, but what happened to his tiny worm-drive starter [Mentioned in the book—Ed. ]—absolutely silent with a current consumption a fraction of any of today's starters and many others. A difficult man to work for, but you had to marvel at his work.